The UK’s largest independent freight forwarder, Europa Worldwide Group, has launched an innovative recruitment programme starting in its Nottingham branch. The new Rapid Career Development Programme (RCDP) has been created to recruit passionate people straight from school. 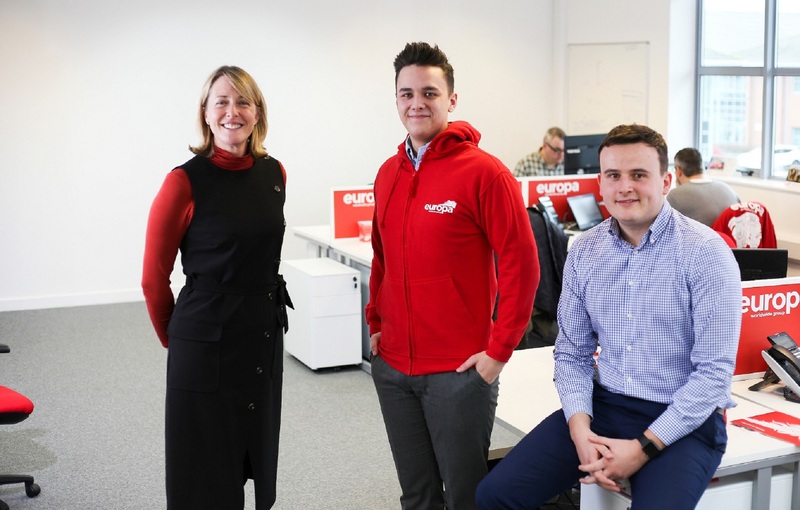 The first successful candidate to secure a job at the £180m turnover business’s Nottingham branch in Colwick Quays Business Park is 18-year-old Max Holbrook who attended Redhill Academy in Arnold. Max excelled through a rigorous application process which involved a written application, submission of his final school report and predicted A-Level grades as well as a one-on-one half an hour interview. The initiative Europa’s Rapid Career Development Programme, is the brainchild of Europa’s Managing Director Andrew Baxter, who aims to recruit 30 enthusiastic and driven individuals straight from school, this year who will then be trained and guided internally to become future leaders of the business. The goal is to appeal to highly ambitious and focused individuals who are keen to learn and earn, to hit the ground running and to start progressing up the career ladder from as early as 18-years-old. “We’re delighted that Max has become the first appointment on our unique RCDP at our Nottingham branch. He really impressed at interview and demonstrated a natural flair already! Europa’s own management team can tell some inspiring success stories of starting at a junior level and working their way up to Director level, moving roles internally and progressing and developing gradually through the business. “This is a great opportunity, I feel like I’m learning every day – this isn’t an apprenticeship it’s more unique, and I’m glad to be part of such a great team here in Nottingham. The aim of the RCDP is to attract young people who are savvy, full of common sense and eager to learn – with the pilot set to be rolled out to Europa Road’s 13 other UK branches this year. Europa Worldwide Group is a specialist road, air & sea and warehouse operator which employs 900 staff across its 16 sites in the UK, plus Belgium, Czech Republic and Hong Kong, Europa has ambitious plans to expand to a £400m turnover operator in the next four years through a combination of organic growth and further acquisitions.